Ok, fret not. I promise not to turn this into a painting blog, subjecting you to each painting I do, but this one I felt was especially appropriate. It was a special request from my younger son, Seamus. He said, “Mama? I want you to paint me a pirate ship.” So how could I refuse a request like that? And really, it’s only appropriate given that our family has a bit of a pirate obsession. 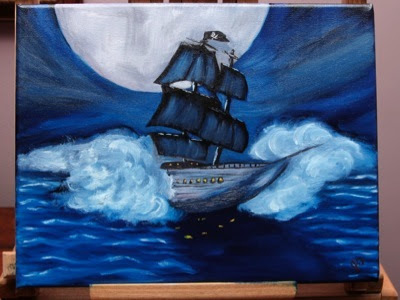 To be completely honest, from the very beginning when I first got my Bob Ross Master Painting kit, I was thinking in the back of my mind about painting a pirate ship. And while my first two paintings were in the “Bob Ross” category, I think it’s safe to say that this one looks nothing like a Bob Ross painting. No happy little trees in this one. It may not be a masterpiece, but it’s definitely good enough for a 3 year old. And I’m proud to say Seamus was THRILLED when he woke up this morning and saw that Mama painted him a pirate ship.